These pencils are just the thing that I wanted for my small sketchbooks. I chose one pencil as an all purpose one out of 2B,4B,6B. I thought 4B is a good option rather than a 6B (too dark). I don't want 2B for sure as it's not enough dark. May be useful to others and perhaps better than carpenter's pencil. Covers area quickly. These are great pencils, I use them. Great for filling in broad areas quickly, hatching techniques and all. It's an art in itself to shave or carve the lead. It's the next best thing to a paintbrush, it's just as versatile. The 2B is for starting out lightly, and for more delicate subtleties. 4B is great for most everything, 6B for contrasts, darkest darks. 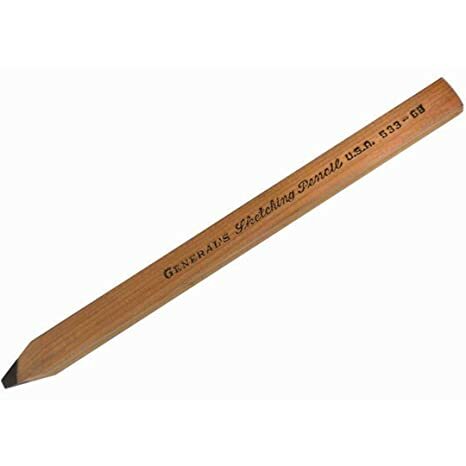 I believe that ordinary carpenters pencil is HB, or a B. Thanks @Forgiveness I'm going on a trip to historic Gwalior. This time I'll just take my small sketchbook, a cutter and this pencil. Will take lots of photos of the grand old fort for sure. Gwalior is famous for the fort, air pollution and Poha-Jalebi for breakfast. Poha-Jalebi sounds like they are asking you to bring your pochade box. Hmm...I didn't know about Poha-Jalebi! Need to try that. I had Poha and Jalebi separately but not together! Why shouldn't I make a series on food paintings? I'm an artistic foodie you know!